For fans of Daisy Styles, a heart-warming wartime saga about a group of women who work in an armaments factory. No matter how hard the times, despite bombing, short rations, cruel men, unwanted pregnancy, through thick and thin friendship will pull you through. Autumn, 1944. Doodlebugs are the latest threat to war-battered southern England. 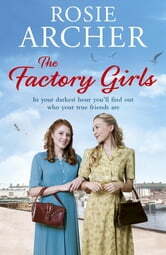 At Priddy's Hard munitions factory though, Em Earle is about to suffer a threat to her livelihood from much nearer home. Local crook Samuel Golden is back and up to his old tricks, trying to find ways to exploit people's hardship for his own gain. As well as Samuel's unwanted attentions, Em has to deal with some huge revelations from within her own family. Her daughter Lizzie is pregnant, and a strange woman has turned up on Em's doorstep claiming to be her sister. Em is excited, but wary - could this woman be too good to be true? Once again it will be up to the girls from the bomb factory to rally round and support one of their own.